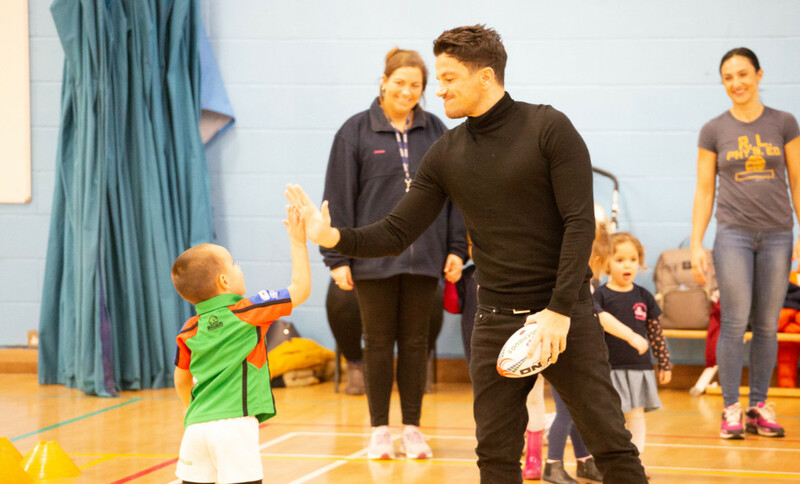 Singer, presenter and TV personality, Peter Andre has exclusively attended a Ruggerbugs class in Harlow, Essex this week in recognition of the incredible fundraising efforts by the children’s activity provider earlier this year. Ruggerbugs, a fun and energetic children’s sports development programme based around non-contact rugby, took part in Children’s Activities Week, during May 2018, along with over 10,000 other activity providers, to creatively fundraise monies for national charity Caudwell Children, for whom Peter Andre is an ambassador, and the Children’s Activities Association. The TV star devoted his time to positively engage with the children in a fun-packed Ruggerbugs session attended by local families and their children. During the high-energy activity, Peter kicked off his shoes and fully committed to the role of rugby enthusiast and child entertainer. Peter was eager to get stuck in with the activity and after the session commented; “ I had been aware of these kinds of events and classes taking place around the country, but I’m thrilled to have been able to get hands-on in a Ruggerbugs class and meet one of the teams behind the incredible fundraising that took place during Children’s Activities Week. Being from Australia I should know all about rugby and so it has been great fun getting involved with the kids and seeing just how happy and active everyone is! It’s wonderful to see the children making new friends and burning off energy – something parents will love too as the kids are sure to fall asleep after all the fun! As well as Peter Andre, the Ruggerbugs class was also attended by local resident and Championship World Record-holding Paralympian Richard Chiassaro, who wowed the children with his wheelchair racing skills and tricks as they attempted to race him through the various obstacles and over the touch line. ‘FALL’ IN LOVE WITH ESSEX!